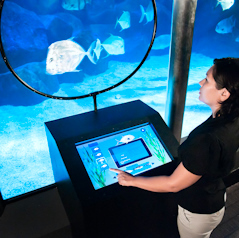 The revamped Oceanarium exhibit at Chicago’s Shedd Aquarium just completed a $50 million renovation and includes an exhibit that includes an interactive kiosk where children can maneuver a mechanical claw to pick up items such as shells and stones that are embedded with RFID tags. A sensor in the claw reads the tag as the item is picked up and triggers an animated video to appear on the kiosk screen providing information about the particular item. The system was created by Chicago-based Mightybytes media design firm. The Shedd is not the first aquarium to take advantage of RFID technology. In 2007 Singapore’s Underwater World began embedding their fish with RFID tags in order to help visitors identify the different species. As the tagged fish swim by a sensor, information is relayed to a touch screen, providing visitors with the name, species and other facts. The Shedd and Singapore aquariums set a prime example for how RFID technology can be used in an educational environment and exemplify the rising trend in interactive educational media in museums, aquariums, and galleries.